Some protesters carried signs: “Unfit to Lead, Impeach,” and “Not my President”. Joe Axton, a 67-year-old artist, pounded a bass drum strapped to his chest to the rhythm of the chants on the Capitol lawn. 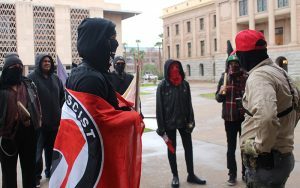 The anti-Trump crowd ranged from the Redneck Revolt, a self-described anti-fascist coalition armed with assault rifles, to the Brown Berets, a Hispanic advocacy group that wielded signs, not weapons. Nancy Salinas, a 35-year-old clinician, said she fears Trump’s presidency will bring nepotism and policies based on profits rather than principles. A few Trump supporters were at the protest but they were followed by the Redneck Revolt group. They shouted expletives as one man, wearing a ski mask and toting a pistol to showcase his support for gun rights, was being interviewed by a television news reporter. The Trump supporter said he was only trying to exercise his First Amendment rights. “I don’t want to come out here to have a fist fight with somebody,” the man said. “I came out here to voice my opinion and see what other people have to say, and that’s it.” He said he didn’t like Barack Obama but accepted him as the president; the protesters should do the same for Trump. 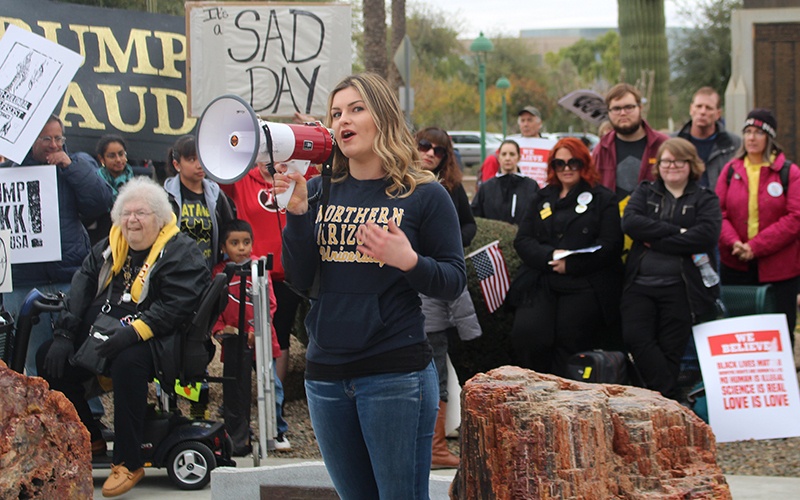 Jana Selig, who coordinated the protest, said the protest shows that many people are dissatisfied with the results of the election and are willing to fight on issues they believe in. 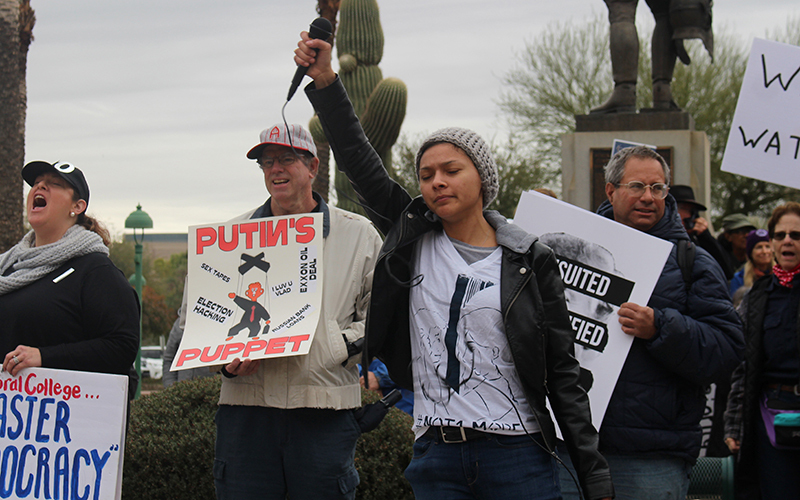 Selig said Friday’s protest should be the beginning of Arizona residents’ activism.